While Constructivism and Stalinist architecture are familiar to a specialist audience, knowledge of postwar Soviet Modernism in architecture is very limited. Much of the former Eastern Bloc’s architecture is regarded as monotonous and uninteresting. Yet a closer look reveals that hardly any linear development of a formal architectural vocabulary can be ascertained. In a ground-breaking research project undertaken by the Architekturzentrum Wien Az W the remarkable architecture in the fourteen non-Russian former Soviet republics between the 1950s and the end of the Soviet Union in 1991 has been explored. 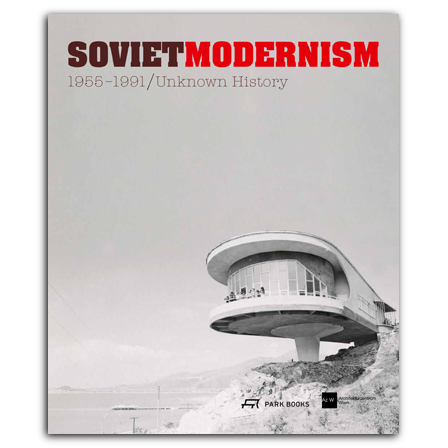 Soviet Modernism 1955–1991 presents this untold architectural history in four chapters: Baltic States, Eastern Europe, Caucasus and Central Asia. Each country is covered with a factsheet including also a concise historical overview, a research and travel report and a scholarly essay. Additional essays investigate Soviet urban planning and large-scale housing programs and typologies of large Soviet cities. A catalogue raisonné of around 400 important buildings, richly illustrated with images and plans, and a bibliography complete the book. With essays by Rasim Aliyev, Ruben Arevshatyan, Vladimir Belogolovsky, Elke Beyer, Gamal Bokonbaev, Boris Chukhovich, Marija Dremaite, Anatolie Gordeev, Mart Kalm, Andreas Kappeler, Philipp Meuser, Rusudan Mirzikashvili, Rustam Mukimov, Ruslan Muradov, Feliks Novikov, Vaidas Petrulis, Oleksiy Radynski, Katharina Ritter, Maija Rudovska, Ekaterina Shapiro-Obermair, Yuliya Sorokina, Iliana Veinberga, Alexandra Wachter, and Dimitij Zadorin. Listed among the Books of the Year 2013 in the Financial Times: "This book is a wonderful trip around the edges of the empire, from the Baltic and the Caucasus to the Central Asian states, documenting some buildings of real invention and faith in the future."